About 40-million tourists, including gamers, visit Las Vegas every year and Aircoins is already-positioned to provide a new form of individual gaming experience. The Earth Dollar and Aircoins Corp. group is envisioning that the entire City of Las Vegas will be instantly turned into an ongoing Augmented Reality Crypto-hunting game which features the Earth Dollar and other professional Cryptocurrencies. Aircoins game App can be played by any number of participants located indoors and outdoors. Venues that the group will be inviting participation from includes the World Crypto Con event group, Las Vegas casinos, entertainment venues, nightclubs, restaurants, coffee shops and arts venues throughout the City. World Crypto Con is taking place at Aria Hotel and Casino on October 31 to November 2, 2018, and is dubbed the “World’s Largest Crypto Conference”. 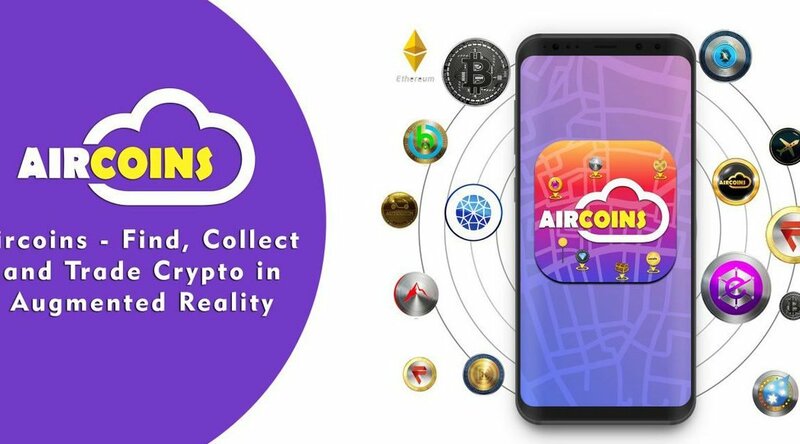 Aircoins has already began work on a release that will rely on the world’s largest AR cloud, which will have information from different systems available in real-time. This will give gamers the up-to-the-second Crypto-hunting and maps information based on their geo-location, as they have been requesting on the group’s Telegram, FB, and IG pages. Augmented Reality (AR) was first made successful with PokemonGOTM, where Smartphone gamers could personally identify and collect valuable digital assets that appear on their mobile handset screen. The App can be downloaded for free, and Aircoins provides each new gamer with AirDrops of coins as soon as sign-up occurs. The more users is registered in a certain area, the more coins appear. A proprietary algorithm allows Crypto-coin supplies to renew and appear in the area to keep gamers happy. Coin supplies are stocked by Crypto companies and advertisers who purchase the capability to drop a mass of “AltCoins” which act as inexpensive advertisements that spur foot traffic by Crypto-hunters. AR works by using a Smartphone cell phone camera to overlay a digital graphic of the collectible item into their real environment. Then, Crypto-coins collected in the Augmented Reality environment are stored securely in a digital wallet that Aircoins provides through a Blockchain provider. Like Earth Dollar, Aircoins imagines how any Cryptos and Blockchain technology will help the poor, save the bees, re-forest areas, support vital area charities, clean up fresh water sources, and finance other positive social activities that detoxify bodies, systems and environments. The Earth Dollar will be providing the Co-branded Earth Dollar Debit Cards to be used in the ATMs and point-of-sale terminals, for integration with the Aircoins App. The Earth Dollar™ will announce the date of its first token sale soon, and is expected to be one of the world’s largest asset-backed Cryptocurrencies with intrinsic value. The Earth Dollar is part of a new sustainable decentralized “Living Economic System” centered on the preservation of natural resources of Planet Earth and revitalizing global economies. Mother Earth Trust will be co-stewarding the preservation of natural resources. The Earth Dollar™ plans to develop a high-speed and scalable Blockchain 3.0 platform to allow nations and asset owners to monetize their dormant, unused, underused and new assets, including their Natural Capital Assets via Smart Contracts and Smart Insurance. The partnership will provide tools to help institutions, banks, governments and organizations, interface with its secure Earth Dollar blockchain. Aircoins symbol is AIRx, and they are not associated with the AIR Crypto. The total supply of AIRx is 10-billion. The circulating supply is currently 1.1-billion. A $300-million market value cap exists on Aircoins platform from their Crytpto partners. According to the company website (www.Aircoins.co), the purpose of the App is to combine fun, Cryptocurrencies, and the in-App convenience of low-cost Crypto exchange. Inside the game, Crypto-coins are free to collect for gamers who download the App. Just as in a traditional (offline) treasure hunt, many types of coins and assets can be located and collected. Found coins are placed into a private wallet that can then be accessed inside the App. In future versions of the game, currencies or Digital Assets collected in the game can then be exchanged. Aircoins games are based on individual activities, are ongoing and can be experienced by gamers both indoors and outdoors. Coins are to be programmed by the Aircoins Launch Team to be dropped by the millions, in anywhere from shopping malls and casinos, to local businesses and event venues. With the Aircoins App, gamers are interacting with decentralized digital assets on a private Blockchain. As described below, the Aircoins App will be integrated with a Global Cryptocurrency Payment System (GCPS) in order to further provide liquidity for supported Cryptocurrencies. The U.S. Blockchain Association is a non-profit trade association serving the Blockchain industry in United States with the focus on creating jobs and opportunities in America. The U.S. Blockchain Association in alliance with other associations worldwide is planning to install 50,000 Cryptocurrency enabled ATMs and point-of-sale terminals across the U.S. This network ties-in to a Global Cryptocurrency Payment System (GCPS) that is being created to handle payment processing of Cryptocurrencies and fiat currencies at both brick-and-mortar retailers, as well as online retailers. The association’s GCPS is expected to handle daily transactions for 250-million people, worldwide. Initial Cryptocurrencies selected to be on the GCPS include: Bitcoin, Bitcoin Cash, Litecoin, Ethers, Earth Dollar, Aircoins and Las Vegas Token. The U.S. Blockchain Association will have different Chapters in cities and states to support overcoming poverty, social justice and creating a sustainable world, which includes fulfilling the Sustainable Development Goals. The association will be helping to recruit major brands, causes, businesses and organizations to participate in Aircoins. Please contact the association for parties interested in having their Cryptocurrency listed on the exchange/ATM/POS. The Nevada Blockchain Association is a non-profit trade association serving the blockchain industry in Nevada, with a focus on fulfilling the Sustainable Development Goals, including overcoming poverty, social justice and creating a sustainable world. The association for the blockchain industry in Nevada will be working with the City of Las Vegas, as well as helping recruit businesses and organizations to participate in Aircoins promotions. To build the Las Vegas Currency Exchange and to install 50,000 Cryptocurrency-enabled ATMs and point-of-sale terminals across the U.S.A. Through work with other associations, the Nevada Blockchain Association is planning to hold an Initial Coin Offering (ICO) for the “Las Vegas Token” with the U.S. Blockchain Association in the coming months. 10,000 units are expected to be installed within the Las Vegas Metro area. The GCPS in Nevada is expected to be able to handle transactions for 2-million residents and 40-million tourists who visit Las Vegas, annually. Including, nationwide payment processing.